Hardboiled eggs on a stick…protein-packed, portable, and no need to touch the egg itself! Grapes become a sweet treat when frozen. Pre-portioned oatmeal cups…just add milk or water. Avocados can be mashed and stirred into a slaw or tuna salad instead of mayo. Remember how I wrote about the importance of the gut microbiome yesterday? It’s probably no coincidence that probiotics are EVERYWHERE these days…in yogurt, kefir, your favorite beverage or smoothie, flavored powder, and pills and FOR EVERYONE…adults and kids. So what is the gut microbiome? The gut microbiome is the collection of microbes or microorganisms that inhabit your GI tract, creating a “mini-ecosystem”. Our gut microbiota contains trillions of microorganisms. Your gut microbiota is specific to you…like your own personal identity card. Facilitate digestion and absorption of nutrients. May have benefits in people with non-digestive issues like eczema or other skin conditions. Can serve as a complementary treatment for digestive diseases like IBS and Crohn’s disease. Optimize the body’s immune system by increasing good bacteria in the gut (especially following a round of antibiotics which kills good and bad bacteria). Have you heard of pulses? Here’s a hint…you probably already have some of them hanging out in your pantry! They include dry peas, beans, lentils, and chickpeas. Pulses are packed with nutrients, giving you a big nutritional bang for your buck. For this reason and the fact that they feed much of the world’s population, they are being called the “superfoods of the future.” Pulses contain protein, fiber, antioxidants, iron, folate and other nutrients. With all of the propaganda, documentaries, and unofficial/unscientific studies out there about various foods, my clients come to me with lots of questions about where food comes from, how animals are cared for, and how the food on their table was grown and produced. 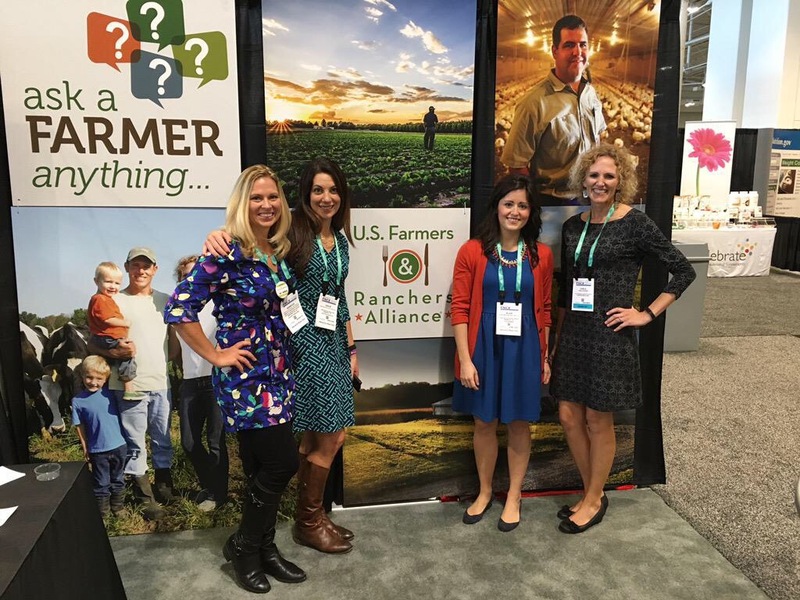 Leslie Schilling, Rebecca Scritchfield, and I spent quite a bit of time at the “Ask a Farmer Anything” booth. You’ve probably heard a lot about “Farm to Table” and sustainability lately, and my clients have the same questions. What better way to learn than by talking to farmers themselves and visiting their farms? Potassium, Magnesium, and Vitamin K play a role in bone health…and prunes contain all of these nutrients! Some mushrooms now contain Vitamin D.
Exercises that involve jumping are most effective for building healthy bones. Eating leafy greens can promote healthy bones. FNCE is a great place for trend-spotting, but so is your local grocery store! What trends with food and nutrition have you noticed lately? I’d love to hear from you! Fro m the moment I drove into Nashville, it was non-stop food and nutrition with around 10,000 of my closest Registered Dietitian friends. The Academy of Nutrition & Dietetics hosted their annual Food & Nutrition Conference and Expo (FNCE) on October 3-6th, 2015 at Music City Center. This conference never fails to provide great opportunities for networking, over 140 sessions on a variety of hot topics in the nutrition world, and an expo filled with over 300 exhibitors sharing the latest products and food trends. To kick off the conference, master innovator and former president of Trader Joe’s, Doug Rauch presented his keynote address: “An Innovative Solution to the Hunger Problem” at the opening session. He recently founded Daily Table (read their mission statement and story here). According to Rauch, Daily Table provides affordable food that moves people forward. 1 in 6 Americans are hungry. Many may have enough calories but not enough nutrients. Code dates and expiration dates are not federally mandated, and many Americans do not understand how to read code dates anyway. For example, Rauch showed a photo of honey with a code date on it, but did you know that honey never expires? Between one-third and 40% of the food grown in the U.S. is never eaten. Lettuce is often thrown away simply because it won’t fit in a bag or box. Who knows what you’ll see from me in the future?! What we eat shapes the composition of our microbiome which can in turn change our disease risk. Check back tomorrow, and you’ll see how all of this new research about the gut microbiome is affecting food trends…stay tuned! We talk about hunger and satiety all the time in our office. This session focused on various factors that impact food choices and satiety (specific tastes, food labels, textures, food components, digestibility, etc.) and how eating frequency, portion sizes, and composition and timing of meals impact satiety levels throughout the day. Sunday evening, I was invited to a Rooftop Reception and Tweet Up hosted by Food & Nutrition Magazine and sponsored by StarKist, Lekue World, CanolaInfo, and National Peanut Board. It was a great evening chatting face to face with many RDs I normally only get to chat with through e-mail and social media! It was an honor to share my Music City Barbecue Sauce recipe with Food & Nutrition Magazine this year! The recipe was featured in the FNCE 2015 issue of the magazine. This speaker provided such a refreshing, realistic, and experienced perspective on health (especially bone health) and training for the female athlete. This was probably my favorite session of the whole conference. You know from this post that I’m all about eliminating weight bias, and these speakers gave concrete examples of how to practice weight neutrality while using motivational interviewing. They encouraged practitioners to affirm patients and clients based on behaviors, attitude changes, and personal discoveries rather than on weight. This session would be worth a listen for anyone who needs help addressing concerns about weight with a loved one. Did you know that RDs can support mental health and play an active role in detox by getting the addict nourished? The body and brain must be fed before true recovery can begin. In other words, food is the best medicine! After stopping by the Ketchum Reception for a bit, it was time for dinner at Husk…delicious! I’ll be using lots of these tools and ideas discussed in this session starting on this blog post! Dietitian or not, if you blog or use social media, this session would be a great listen! Check out USA Today’s Supplement Investigations and this Supplement 411 YouTube video before taking any more supplements. After this non-stop, whirlwind trip to the Music City, the only thing between me and home was a 3 hour drive! I was ready to get back to my family and my own bed (although my friend Emily’s cot was surprisingly comfy! ), and I am looking forward to sharing even more information with you and my wonderful clients. FNCE 2015 was a huge success! Want to hear more FNCE highlights and food trends? Tomorrow, check out the Top 5 Trends that stuck out to me at FNCE 2015.